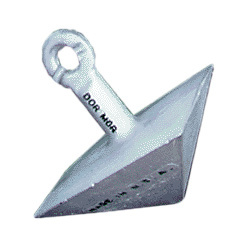 The Dor-Mor pyramid mooring anchor rapidly penetrates the bottom due to the high-point loading of its compact size and shape. The large surface area of the pyramid shape has a high suction effect which increases the deeper the anchor sets. Short shank allows mooring in more shallow water with less chain wrap-up and potential hull damage. Large diameter eye prevents rust-out and accommodates proper size shackle and chain for recommended mooring weights.See our West Advisor on Constructing a Permanent Mooring for more information on how to size your Dor-Mor Pyramid Mooring Anchor. Pyramid Mooring Anchor 135lb. Pyramid Mooring Anchor 200lb. Pyramid Mooring Anchor 300lb. Pyramid Mooring Anchor 35lb. Pyramid Mooring Anchor 400lb. Pyramid Mooring Anchor 70lb.